Researchers identify previously unknown part of the ICL DNA repair pathway. Dividing cells are prone to errors, and so they must be prepared to summon sophisticated emergency systems to deal with potential damage. One type of division-derailing mishap can occur when assault by certain chemicals causes two strands of DNA to permanently connect when they shouldn’t, in what scientists call interstrand crosslinks (ICLs). Properly fixing these crosslinks is crucial to preventing cancer, maintaining tissues, and fertility. To better understand how a cell finds and fixes these misplaced crosslinks, researchers at The Rockefeller University and their colleagues are examining the genomes of patients in whom the repair process is defective. In two separate opensource studies, the most recent described in the journal Molecular Cell, they have identified two new genes in which mutations can produce one such rare genetic disorder, Fanconi anemia, and so revealed new insights on this critical repair pathway. The current study began with samples and histories from patients. In these cases two patients had symptoms of Fanconi anemia,however, no genetic cause had been identified. The results led to the discovery a defective RAD51 protein in one patient, and a similarly dysfunctional protein UBE2T in the other. 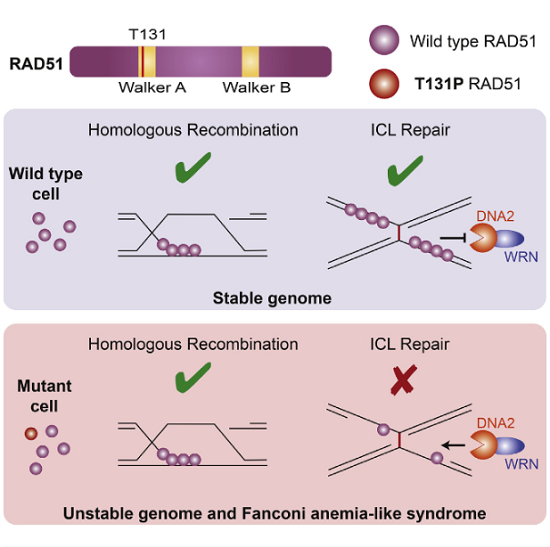 Previous studies show that the genes that code for RAD51 and UBE2T, along with many other genes linked to Fanconi anemia, contribute to a repair process known as interstrand crosslink repair, which fixes a misplaced attachment between two strands of DNA. Caused by chemical agents used in chemotherapies, chemicals called aldehydes that occur naturally within cells, and nitrous acid formed after eating nitrates; ICLs block the replication of DNA, making it impossible for cells to accurately copy their genomes as they divide. The ICL repair process is very sophisticated and uses multiple enzymes that cut away the connection between the DNA strands, freeing them up and allowing the cells to grow. The genome is at constant risk of forming ICLs, and defects in the ICL repair pathway can produce a constellation of symptoms associated with Fanconi anemia, as shown by earlier studies. This in turn leads to a predisposition to cancer, failure of the stem cells in bone marrow responsible for producing blood cells, infertility, as well as developmental defects. In the current RAD51 study the group set out to determine the cause of the Fanconi anemia-like symptoms of a girl in the university’s International Fanconi Anemia Registry. When the team sequenced the protein-coding genes in the patient’s genome, they found mutations in one of two copies of the gene for the protein RAD51. Previous studies had shown this protein to be important for another DNA repair process, called homologous recombination, in which a missing section of DNA is replaced using its sister strand as a template. Homologous recombination is thought to be used during the last step of ICL repair, after the crosslink has been cut. The data findings showed that only one copy of the RAD51 gene was partially defective, her cells could still perform homologous recombination, however, not ICL repair. The researchers note that if both copies of RAD51, which is essential for life, had been defective, the girl would never have been born. To show that the defective copy of the RAD51 gene was indeed responsible for her symptoms, the researchers genetically engineered the patient’s own cells to remove the defect, which restored their ability to fix ICLs. Further experiments on the patient’s cells led the researchers to hypothesize that RAD51 plays a role outside of homologous recombination, by tamping down the activity of two enzymes that degrade the DNA at the ICL. When RAD51 is defective, these enzymes (DNA2 and WRN) become overly destructive. In the lab’s earlier UBE2T study the team found that mutations in a gene for a protein named UBE2T explained the Fanconi anemia symptoms seen in another registry patient. While it was already known that UBE2T is involved in activating ICL repair, the discovery that these mutations could produce Fanconi anemia revealed the protein is an irreplaceable player in the pathway. The opensource study is published in the journal Cell Reports. The researchers surmise that although they have discovered new causes for this very rare genetic disease, the implications of this work go much further. They go on to conclude that by identifying new disruptions to this repair pathway, the medical community can better understand the mechanisms of an event that is crucial to every cell division, a process that occurs constantly within the human body throughout a lifetime. Repair of DNA interstrand crosslinks requires action of multiple DNA repair pathways, including homologous recombination. Here, we report a de novo heterozygous T131P mutation in RAD51/FANCR, the key recombinase essential for homologous recombination, in a patient with Fanconi anemia-like phenotype. In vitro, RAD51-T131P displays DNA-independent ATPase activity, no DNA pairing capacity, and a co-dominant-negative effect on RAD51 recombinase function. However, the patient cells are homologous recombination proficient due to the low ratio of mutant to wild-type RAD51 in cells. Instead, patient cells are sensitive to crosslinking agents and display hyperphosphorylation of Replication Protein A due to increased activity of DNA2 and WRN at the DNA interstrand crosslinks. Thus, proper RAD51 function is important during DNA interstrand crosslink repair outside of homologous recombination. Our study provides a molecular basis for how RAD51 and its associated factors may operate in a homologous recombination-independent manner to maintain genomic integrity. A Dominant Mutation in Human RAD51 Reveals Its Function in DNA Interstrand Crosslink Repair Independent of Homologous Recombination. Smogorzewska et al 2015.